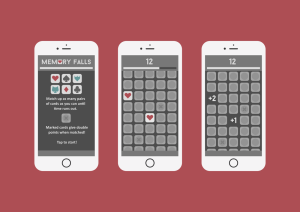 Memory Falls started out as an idea I got over Christmas holidays of trying to create a unique gameplay around classic memory games. 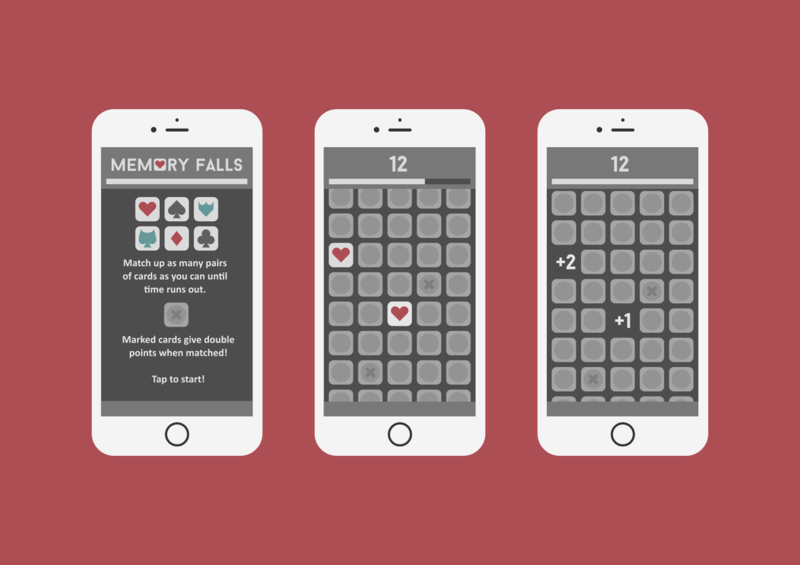 I was playing around an idea of a memory game where the board would continuously change in some way and ended up creating a prototype where the board would scroll through the screen, and the player’s goal was to find as many pairs as possible in a given time.Elliott also had some extra time in his hands and once again helped with the designs. After some testing he found a very interesting theme for the game. We decided to end up with 6 different icons for the cards and he found some old articles about how some sets of playing cards used to have a total of 6 suits. In addition to the usual 4 (heart, clubs, spade, diamond) there were also Shield and Cup. I thought it was an excellent idea and we went with that. The idea I prototyped was a scrolling list of cards falling from the top of the screen and you try to find as many matches as you can before the time/cards run out. Some of the cards would have multipliers and the goal was to reach a high number of points. Turned out the game idea had a major flaw. Moving the cards out of the screen kind of lost the whole point of memory games – memorising the cards. The twist that was supposed to make the game special actually kinda killed the whole idea. Also the best way to play the game was simply to tap everything you saw and it became a game of speed, not memory. Over several months of not working on the game, i tried to come up with new mechanics to fix the problem with the first prototype. Finally I came up with an idea to combine the original idea with the mechanics of Tetris and found it work to really well. Now new blocks fall from the top and you try to find pairs before they fill the screen. I implemented two different game modes, one where a new card falls after every pair you try to match, and a speed mode where cards keep falling faster and faster. Submission caused me a lot more headaches than normally this time. My first submission was rejected by Apple due to Copyright infringements over using the word ‘Memory’. I was shocked about this especially after the huge fight indies put up against King for trying to copyright words like Candy and Saga. However I found out that this was actually an old problem, first mentioned in the news in 2012 by Gamasutra.For now the game is only available in countries where the brand is not trademarked, and we are trying to come up with a new name for the game. The game is available for free here. As a fairly serious chess player I often try to come up with app ideas related to chess. I happened to look for an Elo calculator (Elo is an international rating system used in chess and several other games) and to my surprise didn’t find a free app, only paid ones that looked to have been designed for iOS5. So I decided to spend a bank holiday developing one. I decided to divide the screen into three areas. Top area is the form where you set your current rating, K-Factor (depending on many things, like your age, current rating etc) and your result on the games. The second area is a tableview with all your opponent ratings. New opponents can be added using the +-button at the top right. 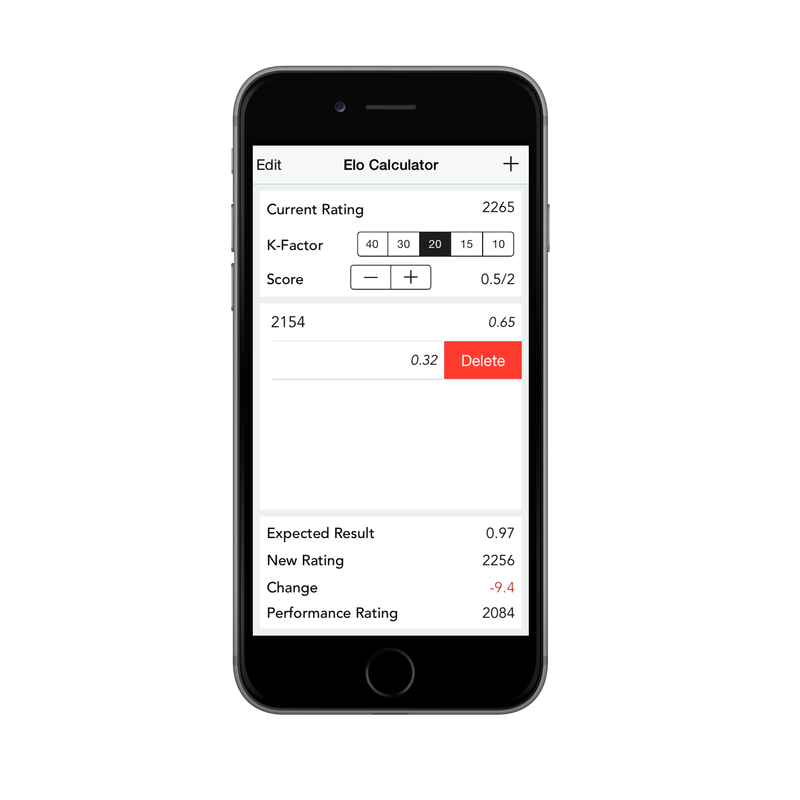 Each opponent has it’s own rating and an “expected result”, which determines the change in your rating. The last area is the results area which presents your expected result (how many points you should’ve gotten), your new rating + change and your performance rating. The calculations use the guidelines offered by FIDE, the World Chess Federation, and it varies a bit from some national methods. 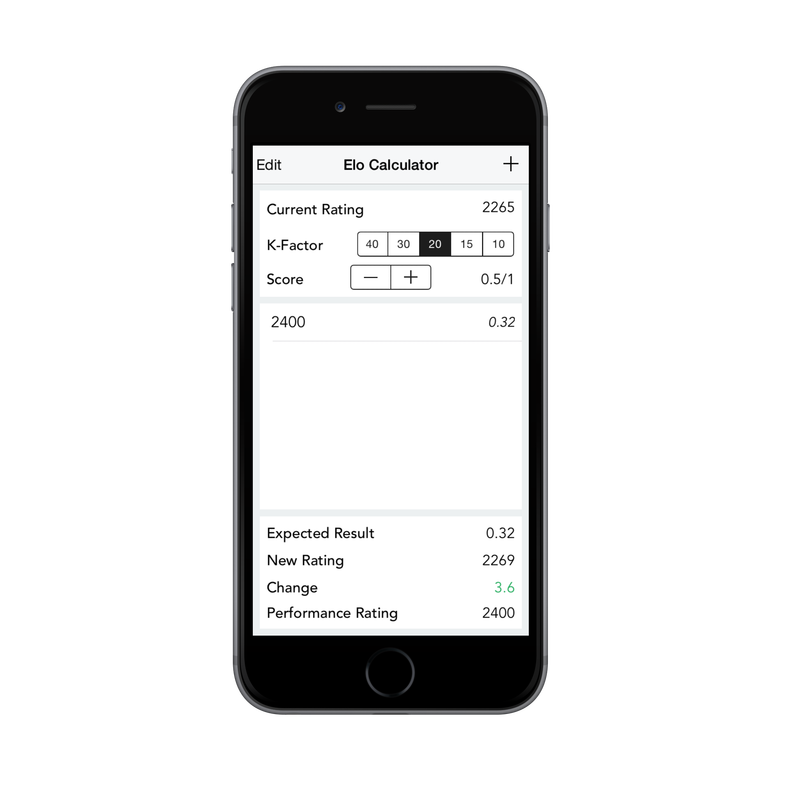 If I reach any results with the app, I might add more national calculation options as well. I’m quite happy with the result and very curious to see if receives any downloads in such a niche market. It hit the store late last night (13.06.2015) and seems to be doing quite well with it’s keywords. The app is definitely not my prettiest one as I didn’t use a designer for it, but it definitely does that job and I plan to use it myself, which I guess is already something! The app is available for free at the Apple AppStore.